Another bird in the house. Actually, 2 of them, zooming through the open bathroom window, heading for the tree branch propped against the wall in the bedroom next to a mirror. Chattering loudly, discovering their mistake, I watched them zip into an abrupt u-turn, one flying past me back out through that open window, the other past me in the opposite direction, through the living room, into the kitchen, bouncing off of things, walls, the window more than once, finally landing dazed in the sink, nestled between a stack of bowls & the sink's edge. I picked her up, dried her with a paper towel, and placed her on a tree limb near Katie's stairs, out of the reach of cats. 5 minutes later she flew like the bird she is, off into the blue blue sunlit sky. I so hoped it was my muse, back from her vacation, but alas, I think I am on my own. Less than 2 weeks until my small, small art show - why can't I remember that? why does it feel so huge & overpowering? - and I feel done. I struggle & push & nothing feels right. Today, a lovely painting of 3 trees, which I have just made too green. For no other reason than it seems like all the paintings that are not white & neutrals are bluey-green and I felt I needed to change that. The trees were just fine bluey-green, I think, and I will be back at them later, but I am pushing. I am inspirationed out. I have painted more in the last 2 months than I have in the last 2 years, and I feel empty. I still have ideas, but nothing that is complete, nothing final, just ideas, just sketches, and I don't want my name on pieces with which I am unhappy. I want the luxury of working on them peacefully, no deadline looming. Each weekend arrives and I want to not paint, I want to do something else, and truth be told, I will be glad when this rushing is behind me. How ungrateful of me, I know, but how wonderful it feels to say. And probably tomorrow I will feel differently - I will know what to do with the brush, I will stop imagining what people will say when they view these pieces, I will agonize less. I will listen to myself - I said to the lovely, lovely Katie earlier how happy I was with these 3 trees on the canvas, how it was possibly done, but I continued on when I shouldn't have. Beneath those trees is a hand holding a bird and another tornado - it has been a busy canvas. I am full of second-guesses these last few days. I looked at the image of this morning's little wren, and thought, oh, this isn't blog-worthy. This is just a cute image, this is something you would just put on Facebook & tell your friends about, if you could, in fact, figure out Facebook, but then I remembered that that is just what I am doing - I am putting it here for my friends to see. So please forgive me if I read your blogs & leave no comment, forgive me if I take another 2 or 3 days before I post here (having said that, I will no doubt be in here at midnight telling a tale), forgive me for complaining. It is just temporary. I am just annoyed at how green those painted trees are. your little wren looks calm..I hope this for you as well! Yes, maybe you need to move away from the paint for a little while and go to a quiet place where your heart can breathe deeply. What do I know about what you need? But, I know it does me a world of good to find a peaceful spot in the trees or under the sky, someplace where you can see the greater perspective. And speaking of perspective, this show IS huge for you! It's not small. That is why you are feeling so many feelings! It is something you have poured your heart and soul into, and I so so wish I could go see!!!!!! Hang in there Debi..it's all coming together so beautifully. Actually, I highly recommend reading her blog post before that one too. oh i know that feeling. sometimes the deadlines are better for me. your work is beautiful - try not to second guess too much. 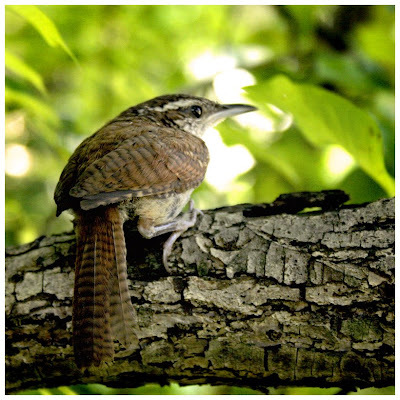 that is a very cute wren and you rescuing her is certainly blog worthy as are all of your posts. Oh, Debi. Jaime is right. This show is big. It's important and special and you are exactly right in wanting it to be perfect. It seems to me that all you need to do now is remember, that your vision is perfect. Already. You know? It is your show. No one else's. The show is going to be great. And so many of us will be there with you in spirit. Sending you much love.